What is a Canon RF Lens? In 2018 Canon introduced an entirely new mirrorless camera system called EOS R. This new mirrorless system has a new mount, the RF mount, which will gradually take over from the old EF mount in the coming years. Canon RF lenses are specifically designed to work with the RF mount. Due to the shorter flange distance (distance from the mount to the sensor plane) of the RF mount compared with the EF mount, it’s not possible to mount an RF lens on an older EF camera. 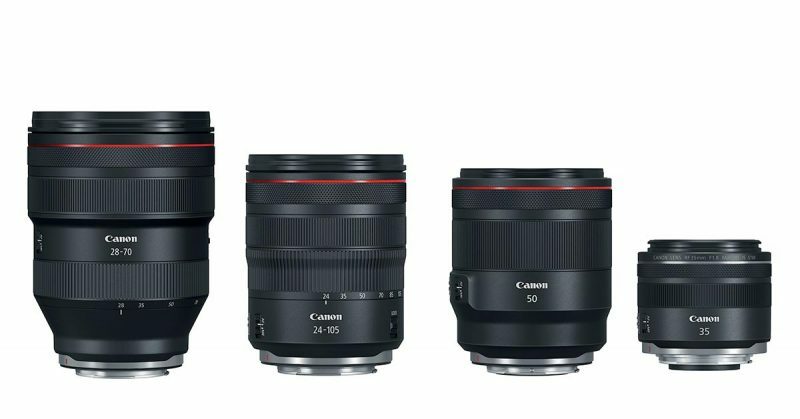 Canon’s first 4 RF lenses. RF 28-70 f/2 L, RD 24-105 f/4 L IS, RF 50mm f/1.2 L, RF 35mm f/1.8 IS Macro. Adapters are available to mount EF and EF-S lenses on an RF camera, but it’s impossible for there to be an adapter to use RF lenses on an EF cameras. The lens simply can’t get close enough to the sensor on an EF camera due to the size of the mirror box. In other words, if you are looking at buying a Canon RF lens you must have an EOS R camera to mount it to, otherwise it will just be an expensive paperweight!